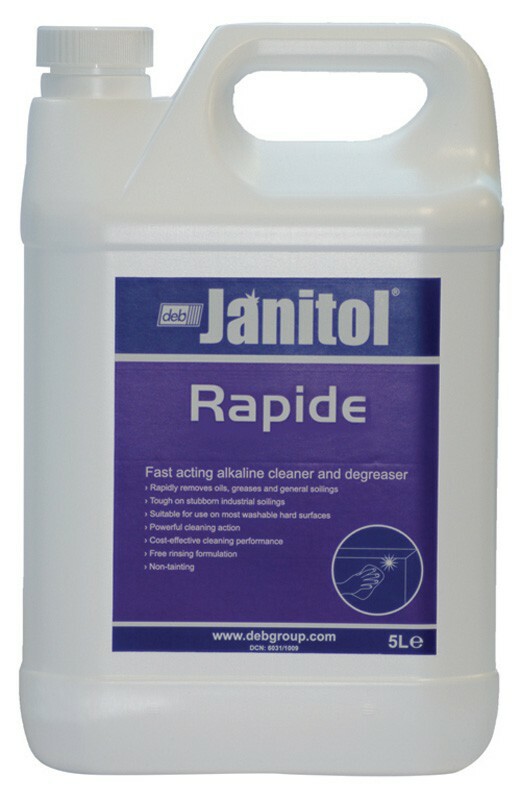 Deb Janitol Rapide is a solvent free alkaline cleaner and degreaser designed for the removal of stubborn soilings. The product is an extremely effective blend of cationic amphoteric and non-ionic surfactants for the effective removal of animal, vegetable and mineral soilings. The product mixes readily with water without clogging jets or other equipment and is safe to use under hot or confined conditions. The concentrated formula can be diluted according to soiling type for maximum cost efficiency and its strong caustic alkali properties provide a strong degreasing power that can be used in conjunction with hot or cold water. Biodegradable - may be disposed of into foul drains. 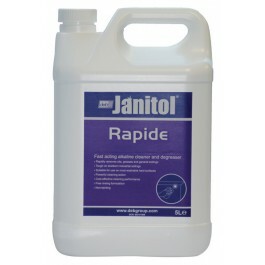 Available in 5ltr, 25ltr and 200ltr containers. Apply the solution to the surface to be cleaned at required level of dilution. Leave on surface for a few minutes to break down soiling (for heavier soiling increase contact time as necessary, but do not allow surface to dry). Rub surface to loosen soiling. Rinse well with water.